While shooting film, you have many variables that can change the outcome of your photos. For example, your film photos could come out differently depending on the type of camera, the process you use to develop your film, how you scan film, and the film stock. Today we’ll be covering the differences between film stocks. Using different types of film will allow you to see many different variations in the outcome of your photos. 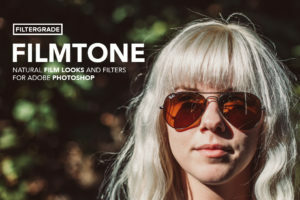 Some film stocks may offer a warm tone, while others may be used for cool, crisp effects. Whatever the reason or need, there is a film stock out there for you! 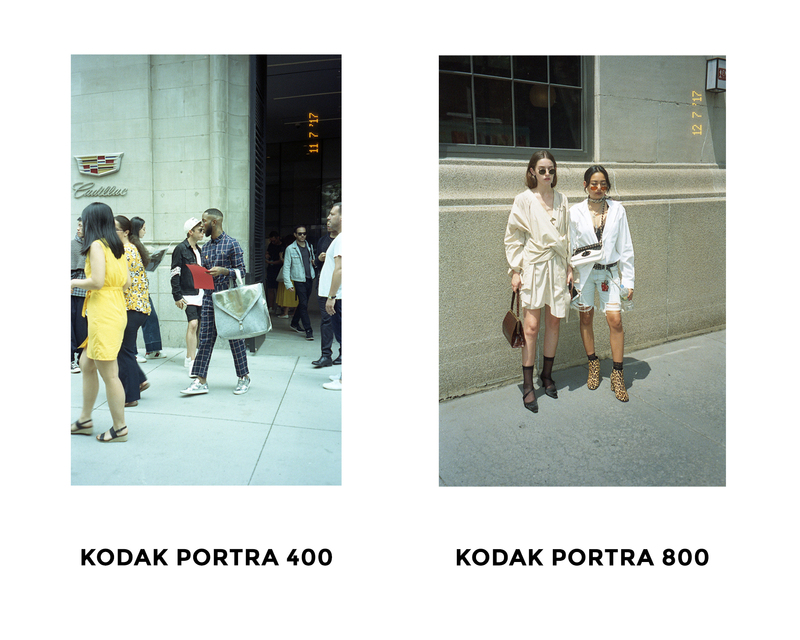 Continue reading below to find out more about Kodak Portra 400 vs. Kodak Portra 800 film stocks. 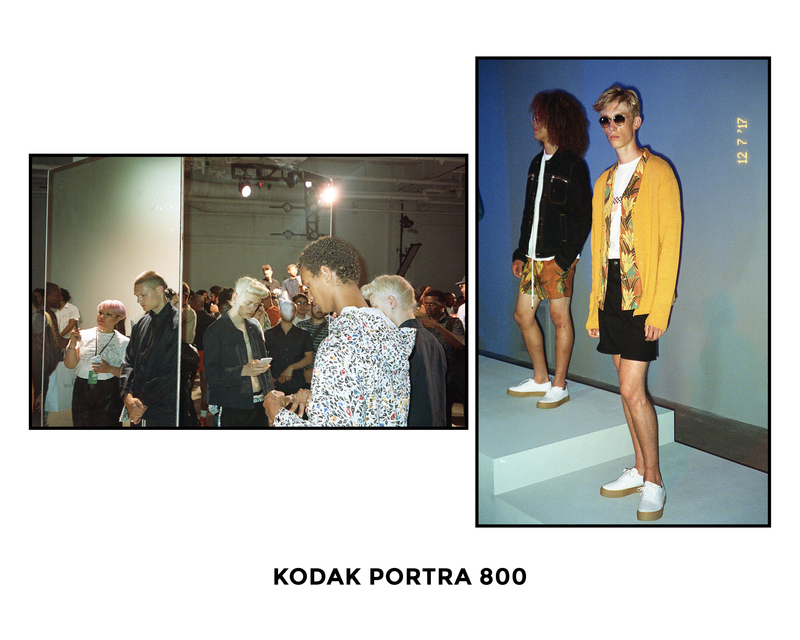 Originally created in 1998, Kodak Portra film was made for portrait and wedding photography. The film stock is made in three speeds: 160, 400, and 800. 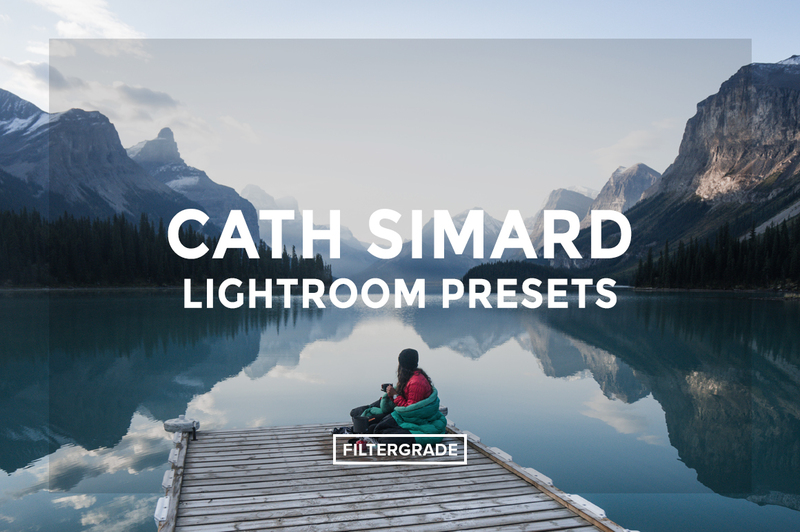 This film is also known for its extremely fine grain for color film which is one of the many reasons why it is ideal for portrait photography. 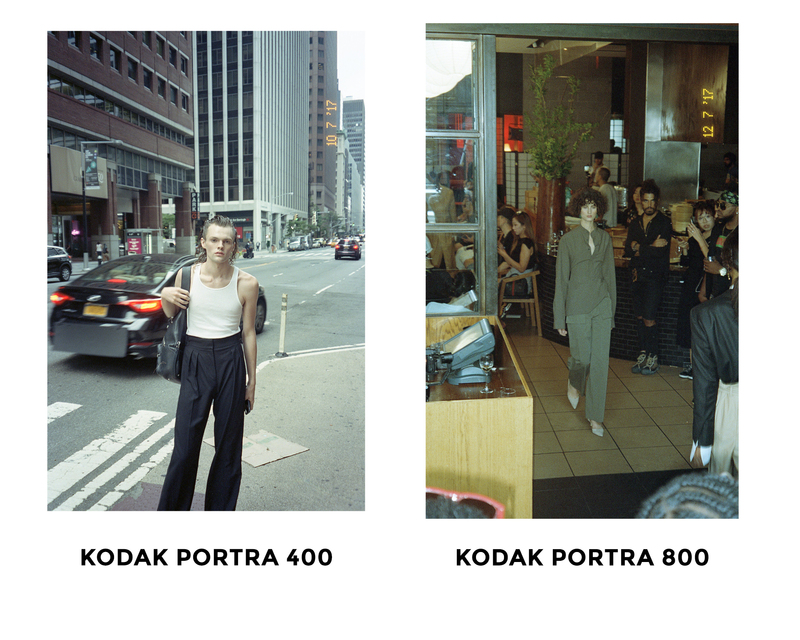 Since releasing the film in 1998, Kodak has also updated the Portra 160 and Portra 400 films to improve image and scanning quality. 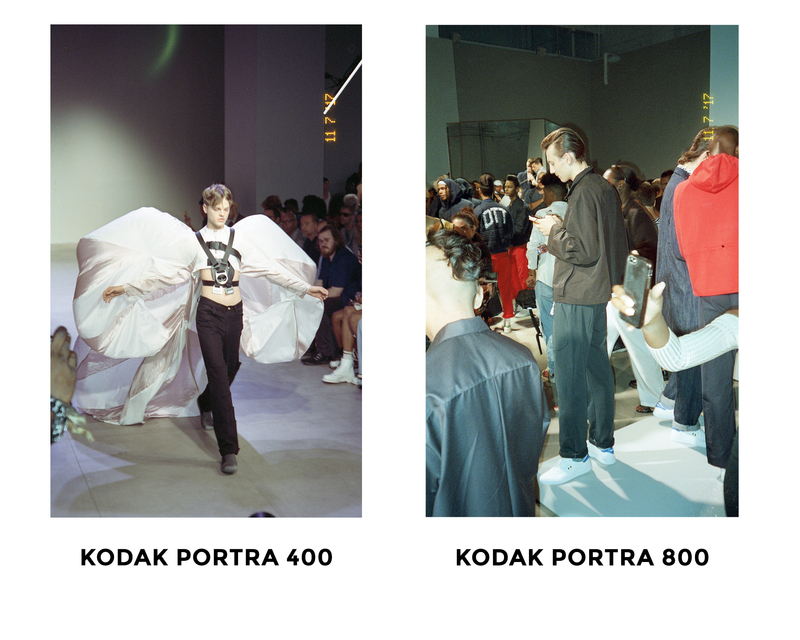 Let’s take a look between the Portra 400 and 800 films in more depth below. As you can see, Kodak Portra 400 is a very vivid film, capturing colors, light, and texture in a crisp format unlike many other film stocks. With a relatively high ISO, the film provides well-lit subjects, even in areas that are shaded or relatively dark. After shooting both Portra 400 and Portra 800, I will say that it is much easier to shoot with Portra 400 during the day time if there is a lot of light. If you shoot with Portra 800 and there is too much light, your photos may have the grain that you were looking for, but they are more than likely going to be overexposed. Next, looking at the grain, you can tell from the two images that the “extremely fine grain film” label on the package of film wasn’t lying. You can feel the grain from the film, and sense that it is a film scan; however, the grain doesn’t pop out too much, it sets the scene and adds a certain mood to the area you are shooting. 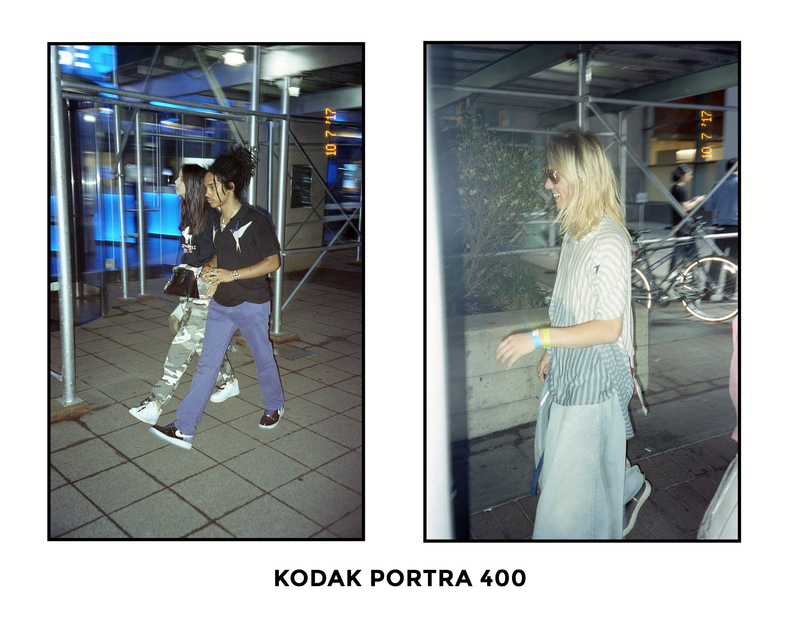 You can also see that if you shoot ISO 400 film with a relatively high shutter speed, you’ll be able to capture people in motion, which is another reason why Portra 400 film is a favorite of many street photographers. 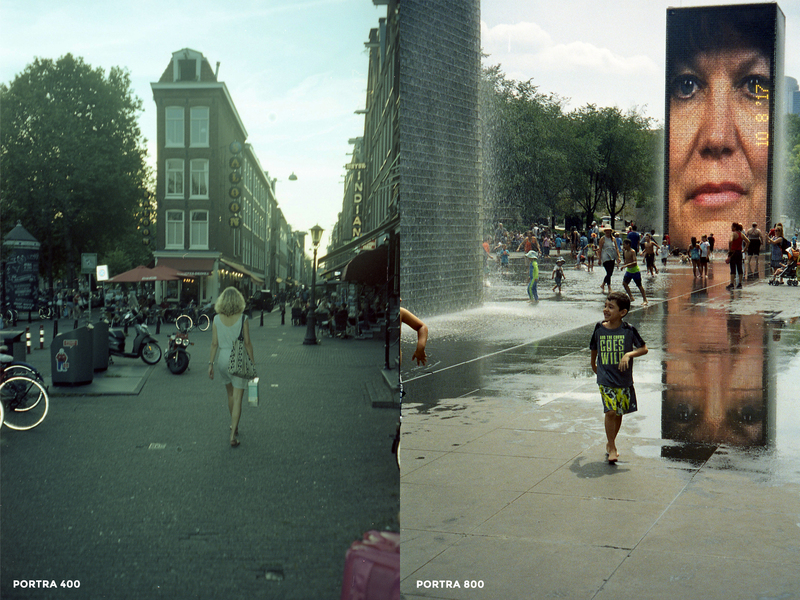 Just by looking at the photos above you can spot some early differences between Portra 400 and Portra 800. One thing to notice about the photos taken with Portra 800 is that they were taken inside in studio lighting in the example above. I shot these inside with Portra 800 intentionally becuase I knew that the indoor, darker lighting would work better with ISO 800 film. This is something you always want to remember when shooting film – know your lighting and know your setting at all times. Another main difference that catches my eye is the grain content. The grain on Portra 400 and 800 are both extremely fine; however, due to the higher ISO, the fine grain on Portra 800 still looks different than the grain on Portra 800. 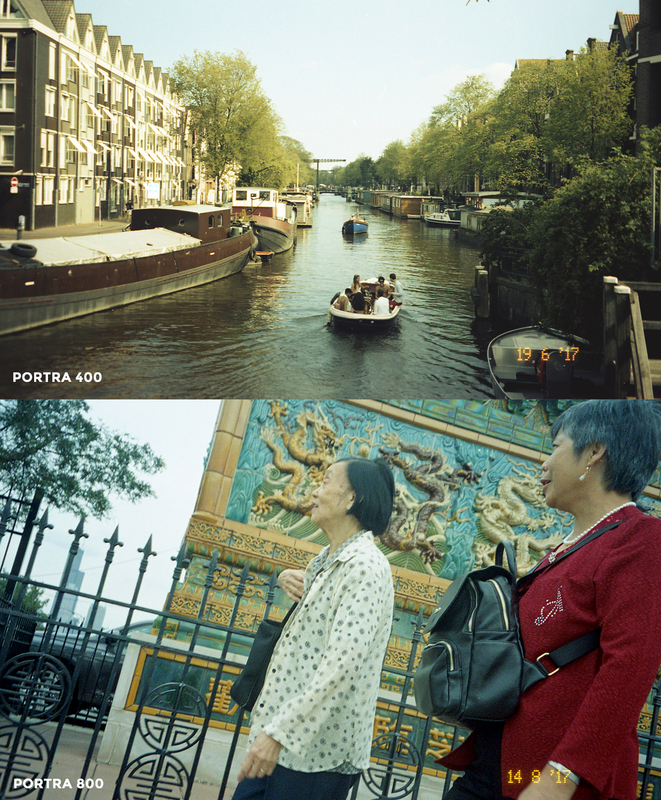 In fact, Portra 800 has a high grain content and sets the stage for the main subject in your photo. 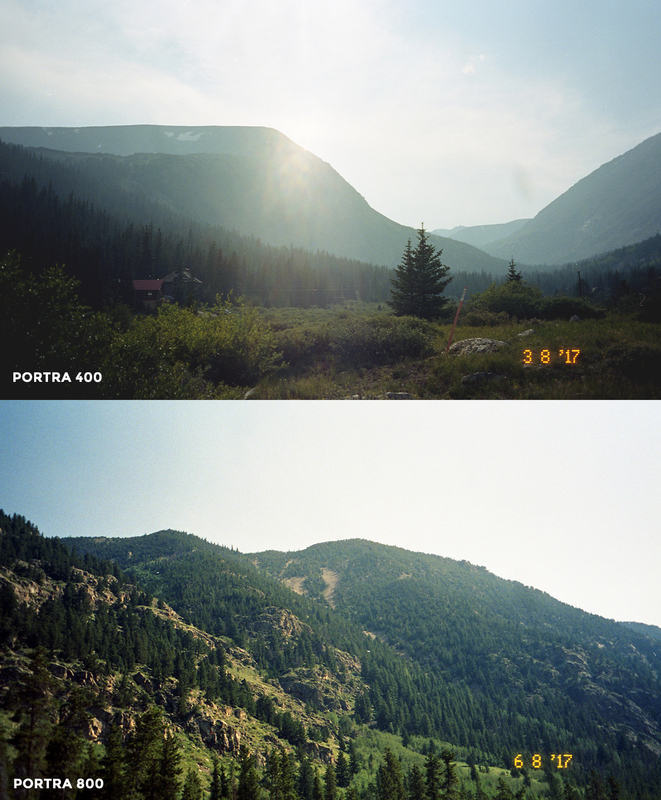 One of the main similarities of Portra 800 and Portra 400 is the color saturation. Both film stocks provide a well-balanced photo with beautiful color, whether you are shooting in daylight or low-light conditions. Another similarity between the two film stocks is the skin tone compensation. Both Portra films are spot on with their skin tones and they do this without hindering contrast or saturation at the same time like many other film stocks do. 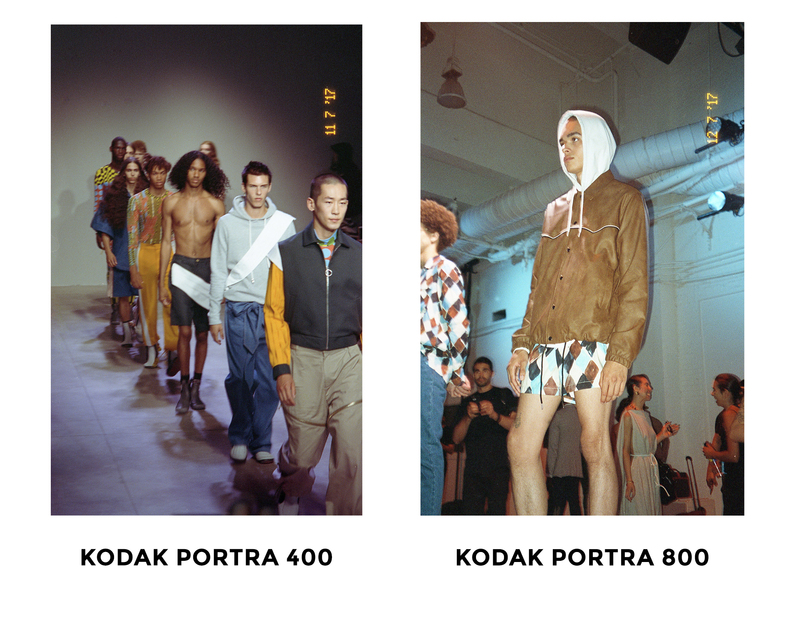 Let’s take a look at some photos from New York Fashion Week and compare how they came out in Portra 400 and in Portra 800. 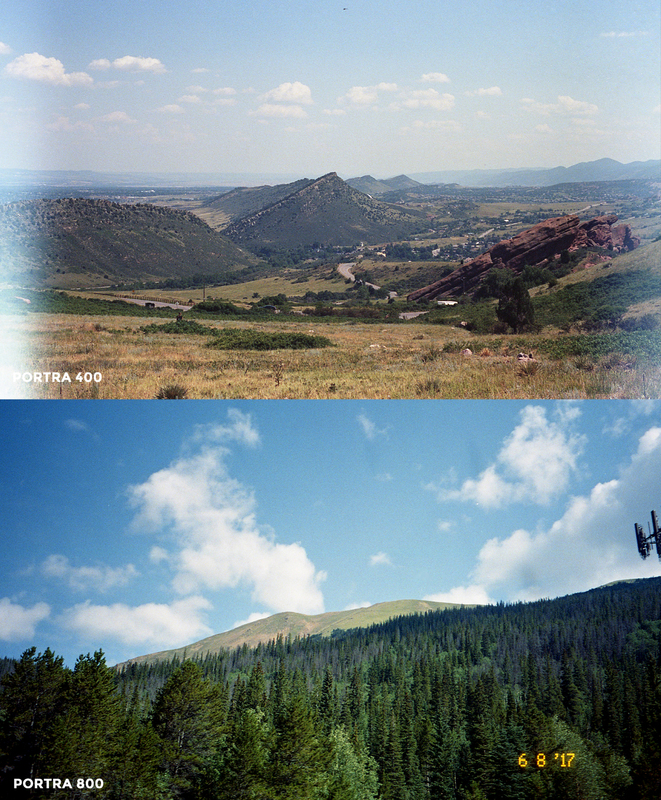 Observing these photos, you can tell that they were taken from the same film stock; however, if you look closely you can tell the fine differences to show Portra 400 and 800. Another feature to note is the contrast and the detail. Portra films work very well with people as the subject, and they work especially well during action scenes or scenes with some movement. Let’s take it inside. With studio lighting and well-lit subjects, the film performs at its peak. As you can see from the comparison above, the Portra 400 film snapped in a flash to catch the first subject in focus while the line behind him fades to a blur. As for the still model on the right, the ISO 800 film was able to provide a heavy grain setting while providing a clear focus on the subject. In the photos above, you can see how both films work when there is flash involved. I find that the grain is more visible and prevalent when I shoot with flash and especially when I shoot with flash indoors. Playing with flash and various ISO’s will help you find the perfect grain content that you are looking for. Lastly, looking at the detail and clarity while using Kodak Portra films, we are able to see emotion, expression, and excellence. I find that I am able to capture all that I am looking for when I use Kodak Portra for shooting Portraits/Fashion. Still looking for more film photography articles? Learn What Happens When You Mix Up Blix with Developer and How to Load Film into your 35mm Camera. How are you scanning these? Your tests aren’t very scientific as you are shooting both films in very different lighting conditions. 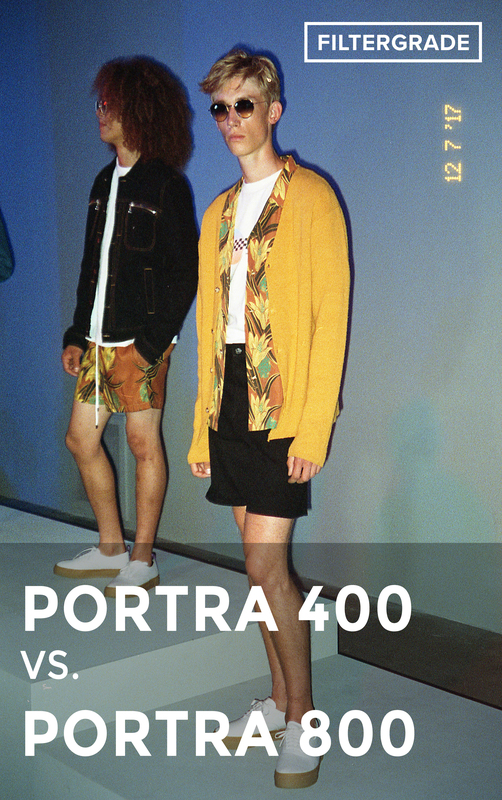 Portra 400 is also based on Vision 3 technology while Portra 800 isn’t, so 400 is designed to be pushed much more than 800 is. Your white balances are also all universally off as well. Just my two cents. Camera are you using for this? Hi James, these photos are from the Nikon FE, Nikon FE2, and a Pentax point-and-shoot camera. WHAT IS THE POINT IN TESTING FILMS AND SHOWING IMAGES THIS SIZE??????? Sorry about that, just updated with some larger images to more clearly show the differences between the films. Mike, appreciate the work that went into it, but I came here to see the grain. 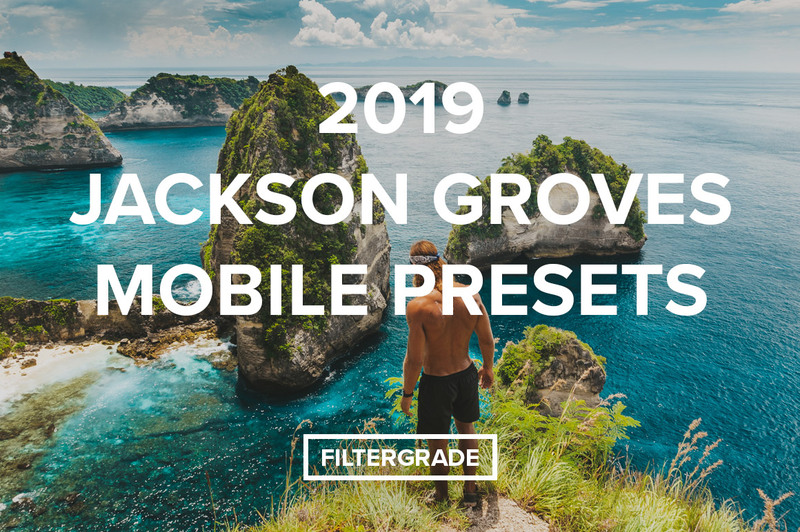 MAKE IMAGES CLICKABLE for full res. As it is it is not a film review, just some photo show off. What Point and Shoot were you using? And what’s the max ASA of the camera? I was using a Pentax Espio 140V, the max ASA on this camera is 3200!